Rosa E. Shelton is an associate with Buscemi Hallett, LLP. Her practice focuses on insurance coverage litigation and construction disputes. Ms. Shelton graduated from San Diego State University in 2005 with a Bachelor of Arts degree in Political Science. She obtained her Juris Doctor from California Western School of Law in December, 2011 and became a member of the State Bar of California in May, 2012. While in law school, Ms. Shelton was selected as a finalist in the 1L Moot Court Competition and focused her studies on civil litigation, negotiation and alternative dispute resolution. Prior to being admitted to the bar, Ms. Shelton received significant experience clerking on cases concerning consumer class actions, construction defects, employment, business, asbestos defense, and insurance matters. 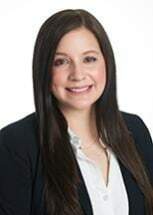 Ms. Shelton has extensive experience in all phases of civil litigation including discovery, trials, arbitrations, settlement negotiations, and appeals. Ms. Shelton is admitted to practice before all California state courts and the United States District Court for the Southern District of California. Ms. Shelton is also a member of the San Diego County Bar Association.